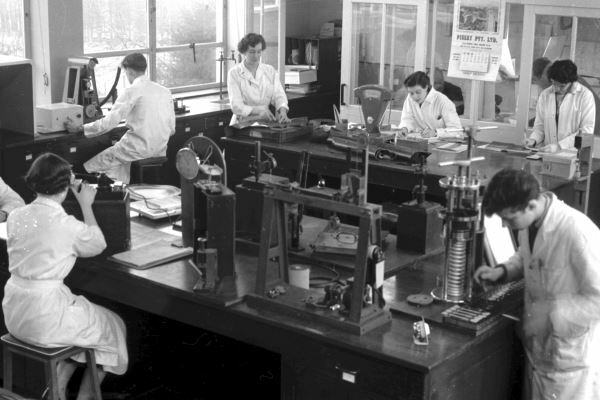 Revealing the research and testing work done at SATRA in the fifties. SATRA made significant progress in the technical field in the years following World War II and by the end of 1950, there were 69 members of staff. Keeping up-to-date with the latest advances in footwear production, research programmes considered such issues as the construction of shoes in transparent plastic, American plastic welting, resin rubbers, plastic-coated fabric, comparisons of productivity and infrared drying. During 1953, the USA made ‘conditional aid’ grants to various countries to assist their economies, promote productivity, stimulate competition and prevent restrictive practices. Funds were allocated to SATRA through the British government’s Department of Scientific and Industrial Research, to report on technical intelligence, the training of operatives and the study of machine controls. Sixty-six years ago, men stood on the top of the world for the first time, and SATRA played a vital role in getting them there. The summit of Everest – the highest mountain in the world (some 8,848m above sea level) – was finally reached by New Zealander Edmund Hillary and Sherpa Tenzing Norgay on May 29th 1953 as part of the British Expedition. SATRA had been approached by the Expedition team the year before, and accepted the responsibility of designing footwear for the final assault on the very top of the mountain. The specification for the boots seemed to be straightforward – it called for warm, strong and comfortable footwear that could be fitted with crampons and be simple to both put on and take off. It was apparent, however, that some new and radical ideas would be required to help the climbers cope with the conditions at such extreme altitudes. Up to the time of the British Everest expedition’s approach to SATRA, climbing boots had usually been manufactured from bulky deerskin cocoons which were thigh-length and cumbersome – certainly not the type of footwear needed for such an extreme climbing challenge. SATRA director of research Harry Bradley was given the responsibility of producing the concept for a revolutionary design. His achievement was a very warm, low and lightweight boot which set the style for many commercial productions during following years. A team of experienced SATRA footwear experts initially produced four trial pairs of boots. The insoles were made from leather with a lightweight rubberised fabric backing. Rubberised fabric was also used for the linings, and all seams were sealed with latex. The uppers called for a flexible and light leather which exhibited reasonable water repellence. Glacé kid was selected for this essential component, and it was sprayed with latex to provide an added level of protection. Part of the design called for these uppers to be made considerably larger than the linings so that ample amounts of ‘Tropal’ insulation material – described as ‘an uneven web of kapok fibres’ – could be included. The decision was made to cement-last the rubberised fabric linings to the backed insole. This resulted in the formation of a completely moisture-proof inner ‘skin’. This vapour barrier prevented the insulation from becoming wet, which would have reduced the insulation’s effectiveness. It was deemed as acceptable for the climber’s socks to become wet, as long as his feet remained warm. The leather box toes and counters were moulded to the last during the construction process. An insulating undersole of high-grade felt around 10mm thick extended a similar amount either side of the insole, and the Tropal was cut so that it touched the felt undersole. The upper was then hand-lasted over it and cemented down, in order to avoid compressing the insulating material. A reverse welt was hand-sewn through the felt undersole, and a firm but lightweight micro-cellular resin rubber outsole (which measured just over 10mm thick and with cleats individually cut into each sole) was both cemented and sewn into the welt. Saran socks, which included several layers of Tropal insulation in a sealed envelope, were then inserted into the boot, as were two pairs of duffle socks (a coarse, heavy woollen fabric). At the outset, the four sample pairs of the SATRA Everest boot were made and sent for assessment in the Swiss Alps during December 1952. Weighing just 1.9kg, they were far lighter than comparable footwear (for example, Swiss climbers in an earlier expedition wore boots which weighed 2.9kg). Without the benefits of the climatic chambers SATRA has today in its UK headquarters, the cold weather test facilities at the Royal Aircraft Establishment in Farnborough were utilised. The SATRA team’s hard work and knowledge impressed the expedition leaders, who agreed that what SATRA had produced was the best boot for the team. The risk of taking an untried footwear design to the top of Everest was outweighed by the advantages it offered. The SATRA boot proved so successful that a total of 35 pairs were then requested, which were handmade to fit each member of the expedition team. The sizes required varied tremendously – some of the Sherpa guides needed UK size 6 boots suitable for a very wide fit. By contrast, Hillary’s size 12 feet were narrower than some of the Sherpas’ feet. The overall production time was very short, with the delivery deadline for the finished boots being just five weeks after the start of the design work. Each pair was delivered complete with removable rubberised stockinettes, which were fixed to the outside edge of the sole in order to provide extra protection from wet snow. After the team’s successful ascent, expedition leader Sir John Hunt wrote to SATRA, stating that the boots had been worn by all members of the party above an altitude of 6,100 metres and were a great success. Unlike any previous Everest expedition, not one of the British team had suffered from frostbite in their feet. Having been knighted by Queen Elizabeth II for his role in the conquest of Everest, Sir Edmund Hillary later travelled to Kettering to thank the SATRA team for their sterling efforts. SATRA is proud of the part it played in the successful ascent of Mount Everest in 1953, and likewise today considers it a privilege to work with major footwear companies which are involved in the design and production of high-altitude climbing boots. It is said that mountaineers climb mountains ‘because they are there’, so there will always be a need for the best – and safest – footwear to help such men and women achieve their goal in some of the most hostile conditions on Earth. 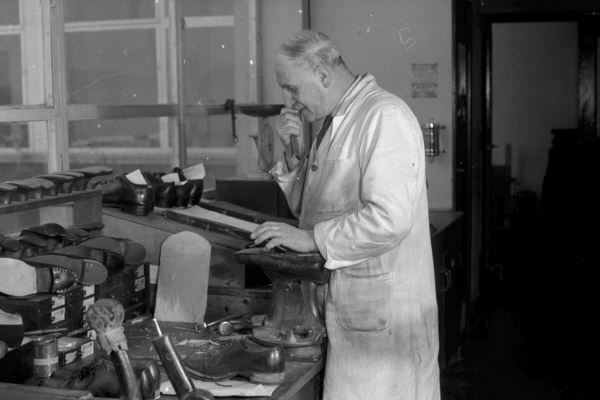 Research work in 1954 was dominated by investigations into adhesives for cemented sole production. Intensive effort was also applied to developing upper leather economy. During the following year, technical enquiries again increased. Growing interest was also shown in SATRA test equipment, and members were informed that 32 different machines and devices were available for purchase. An indication of the diverse range of projects engaged in by SATRA experts can be seen in the April 1956 issue of SATRA Bulletin. It reports that Northamptonshire and England fast bowler Frank ‘Typhoon’ Tyson had approached SATRA because he was facing a problem that was seriously affecting his career as a top-class cricketer. Due to the continual impact and friction experienced when his left foot struck the ground at the end of his bowling run, he had developed what were described as ‘painful and disabling lesions’ on the outer edge of his heel. After a consultation with Mr Tyson’s orthopaedic specialist, SATRA was asked to assist. Considerable experimentation led to a leather foot glove being designed to reduce both impact damage and friction. It was made from seven components that were fitted with adhesive and stitched onto a slightly undersized wooden model of Mr Tyson’s foot. Alternative padding materials for the heel of the boot were tested for maximum compression, and a firm microcellular rubber was finally selected. It was carefully skived and fitted to give a perfectly smooth interior and was finally covered with a leather sock of generous size. On his return from the West Indies, Mr Tyson reported that the foot gloves and the boots had been completely successful during the tour. Several pieces of shoemaking equipment were designed by SATRA during the 1950s. One of these was the vapour sole-tempering cabinet. A prototype was designed by John Bunten, Frank Goffe and Ron Skelham and built in SATRA’s workshop. After laboratory trials, this was installed in Stead & Simpson’s Leicester factory, and several months later, the company reported satisfactory results. Another example of SATRA design during this decade was a process control system, the prototype of which was installed in the Leicester factory of Freeman, Hardy & Willis. The equipment was reported as achieving a reduction of finishing room ‘faults’ from five per rack of 12 shoes in September 1955 to one fault per rack in the following April. Other newly-designed items included the non-destructive sole adhesion tester, quarter height gauge, radiant heat dryer for shoe bottoms, electrical moisture meter, insole assembly jig and motion economy device for welt sewing. 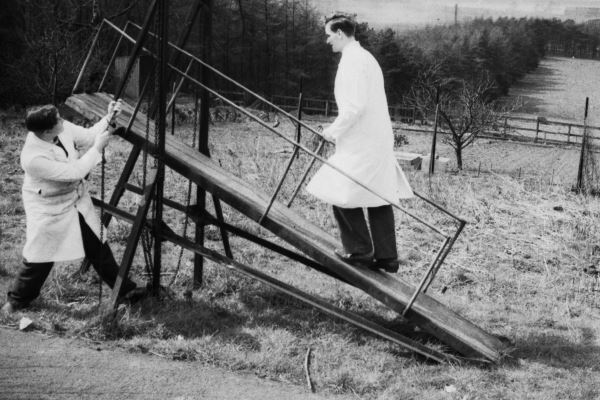 Of all the exhibits at SATRA’s well-attended open events held on two days in April 1956, none were reported to have created so much interest as the association’s ‘automatic feeding and collecting devices’ that were being developed at that time. The automatic feeding of a surface scouring machine and a sole stamper were demonstrated by means of a rubber suction cup that was connected to a suction pump. That pump also supplied power for mechanical movements of an arm to which the suction cup was attached. For the surface scourer, the suction cup moved to make contact with a sole unit, which was then lifted before being released into a feed roller as a suction relief valve opened. The arm then returned to the stack of soles to collect another and the process continued. The soles sat on a bed which automatically rose as each sole unit was picked, and the scoured soles were ejected by the machine onto an inclined chute after which they dropped onto a collecting platform. While the feeding device for the sole stamper was similar, the swinging arm travelled through 180 degrees rather than 90 degrees, and allowed a stamper to make an impression before the sole was again dropped onto a collection platform. 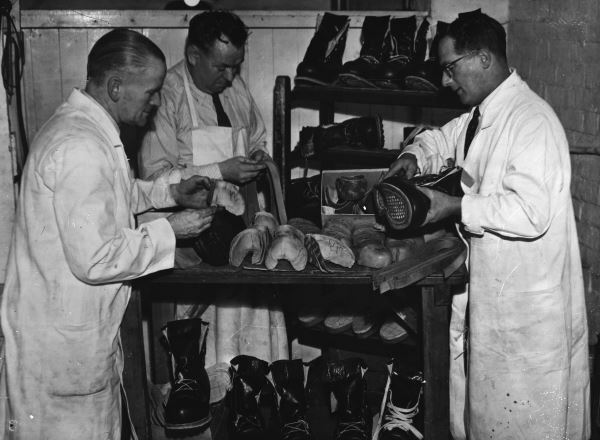 A variety of other shoemaking applications were suggested within the April 1956 issue of SATRA Bulletin, and within a year the prototypes had been refined sufficiently for factory trials to be announced. Technical reports were issued on many topics, including hallux valgus and burning sensation, and also on the use of plasticisers, rot-proofing agents, cemented footwear and transport systems. Members of staff visited France, Germany, Italy, Sweden and the USA as part of SATRA’s international activities. 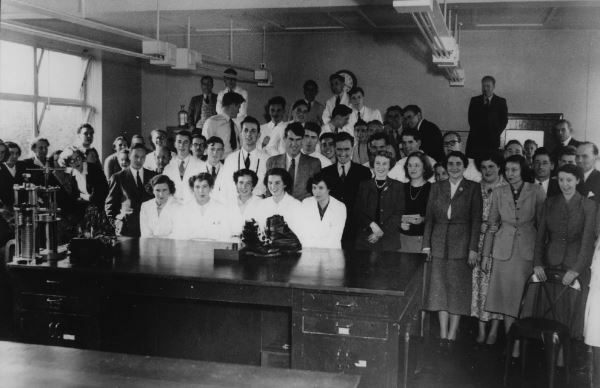 In 1958, the annual general meeting was followed by a successful ‘open day’, with representatives of many footwear companies visiting the laboratories. 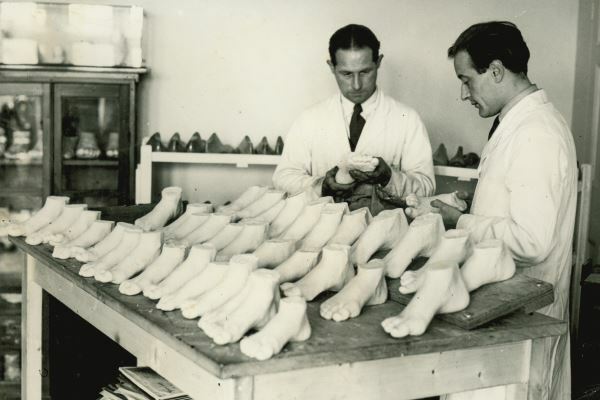 Technical reports were published during the year on such topics as moulded-on footwear and closing room efficiency. A year later, SATRA’s technical programme included research into last and fitting work, safety boots and materials testing. Looking back at SATRA’s progress in technical innovation during the 1950s reveals an impressive catalogue of achievements. By the end of the decade, the number of SATRA employees had grown to no fewer than 94, and the association’s turnover had grown from £45,000 in 1950 to an impressive £102,000. SATRA will be marking the milestone of its centenary in May 2019 with a number of special events. A commemorative publication will also be produced to highlight the progress made in the field of research and testing during the past 100 years. This article was originally published on page 12 of the April 2019 issue of SATRA Bulletin.